PCSX 2 is the only PS2 emulator around, and it's quite a masterpiece, despite being a bit of a bear to configure. You can download PCSX2 from its official website with its most up-to-date plug-ins automatically packed in, and with a configuration wizard that walks you through the whole setup process. Download, run the installer, open the emulator, and you'll be staring down that very wizard. If you have five or ten spare minutes, read on, brave soldier. The only two options you'll probably want to change (apart from remapping the control pad) are the CD/DVD and the GS (read: video) plug-in. The first part is easy. If you aren't using original discs, you want the ISO plug-in available from the drop-down menu. Tinkering with the video plug-in is a bit more complex. You'll notice that multiple 'GSdx' entries are available from the drop-down menu, each naming a different one of 'SSE2', 'SSSE3', and 'SSE41'. For maximum efficiency, you'll want to use the newest (that is, the highest-numbered) of the different CPU instruction sets that your processor supports. The easiest way to figure this out is to download and run a program called CPU-Z. 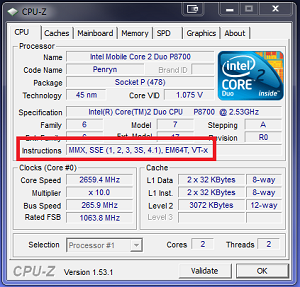 The relevant information will be in the 'instructions' field of the CPU tab, as shown in the illustration below. Check the Instructions field in CPU-Z. After you've determined which GS plug-in you want to use, configure it by clicking the Configure button next to the GS drop-down. Of the available renderers, 'Direct3D10 – Hardware' will probably be quickest if your computer supports it, though Direct3D9 should work nearly as well for most games. You can leave the 'D3D internal res' alone (its description is somewhat misleading, and the default setting of 1024 by 1024 won't lead to a particularly ugly or stretched display at any resolution). Later, if you have speed issues, check the use original PS2 resolution box; conversely, if you have a powerful GPU and like high-res textures, set the 'use Scaling' dropdown to 5x or 6x the native resolution. From here, simply point it toward a PS2 BIOS image (such as SCPH10000.bin), and you're all set. Once you've reached the main menu of the emulator, uncheck the Show Console option from the Miscellaneous settings menu, so that the emulator will stop neurotically printing a log of every step it takes. Next, open Emulation Settings from the Config menu, and click the Speedhacks tab. The default settings there are a bit conservative, so check the Enable speedhacks box, turn the 'EE Cyclerate' and 'VU Cycle Stealing' options to 1, and enable the mVU Block Hack. In the unlikely event that anything goes wrong with a game you're playing, come back here and disable these. Close the menu, and you can run some games. (If you'd like to tweak any more settings, consult the in-depth configuration guide available from the official forums). Some games don't run especially well in PCSX2, but that list is by now relatively short and continues to get shorter. The only game that I wish were a little less sluggish is God Hand, Capcom's underappreciated quasi-masterpiece brawler, which struggles to move at more than 40 frames per second on my machine. Frameskip doesn't help, unfortunately, because the GPU is scarcely taxed more than it would be in trying to render any early-aughts PC game; the problem is the CPU struggling to keep the PS2's multiple cores chattering together at a decent clip. This is the case with emulators of most "modern" consoles, and though not much can be done about it, you should be aware of it, especially if you plan on upgrading your machine to run newer emulators. Enabling VSync (a feature designed to ensure that the entire screen gets redrawn at the same instant--and commonly used to prevent "tearing" of the display when the camera pans in first-person shooter games) can cause considerable slowdown in PCSX2, and generally isn't recommended, because modern emulators are much more CPU-intensive than GPU-intensive. 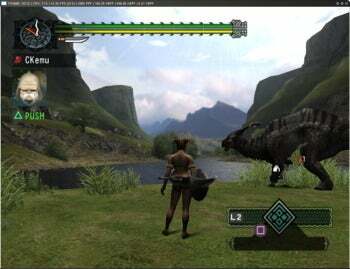 In some cases, emulation necessitates that the PC's CPU handle graphics-processing functions of the emulated console (thereby compounding the existing bottleneck), and PCSX2's VSync is one such emulator. Just don't enable VSync, and hopefully you won't miss it.